Rev. Bernard J. Ezaki, M.Div., M.A. Legally blind from birth, Father was kicked out of the Cathedral School because of his poor eyesight. After attending Jefferson Elementary School and South Mountain Junior High, he was graduated from William Allen High School in 1975. 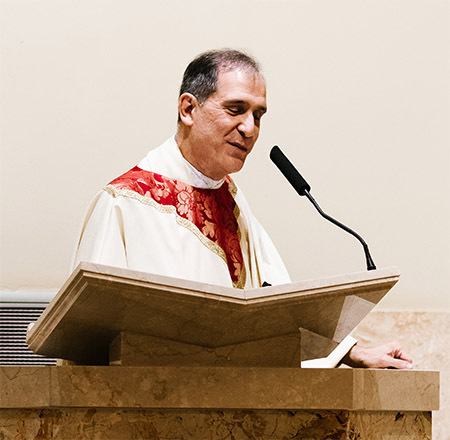 Today he holds degrees from Moravian College (Bethlehem, PA), Harvard Divinity School (Cambridge, MA), and St. Charles Borromeo Seminary (Overbrook, PA). Father Ezaki was ordained to the priesthood on June 4, 1988. His first year as a priest was spent happily as an assistant pastor at St. Peter’s Church in Coplay, PA. From the fall of 1989 until the spring of 2013, he resided at Notre Dame of Bethlehem Rectory (Bethlehem, PA) and taught theology to sophomores at Bethlehem Catholic High School, all the while exacting vengeance for having been “asked” to leave the Catholic school system at a tender age. His first students (Class of 1992) are only now emerging from extensive psychotherapy. As a result of his prolonged contact with tenth graders, Father’s ability to communicate has been somewhat curtailed and occasionally lapses into inarticulate grunts and meaningless syllables (e.g. “like,” “ah,” and “um.”). He has, in fact, very limited experience of the real world, having spent fifty Septembers in the classroom, either on one side of the desk or the other. As an assistant at the Cathedral in Allentown (spring of 2013 to autumn of 2016), he was noted for his terroristic threats to altar servers. Father has learned that the secret of Christian joy is nothing less than gratitude. At age forty-five, he discovered a sentence in a book that changed his life: “I’m not grateful because I’m happy; I’m happy because I’m grateful.” Today he is a grateful assistant pastor at Saint Jane Frances de Chantal Church in Easton, Pennsylvania. 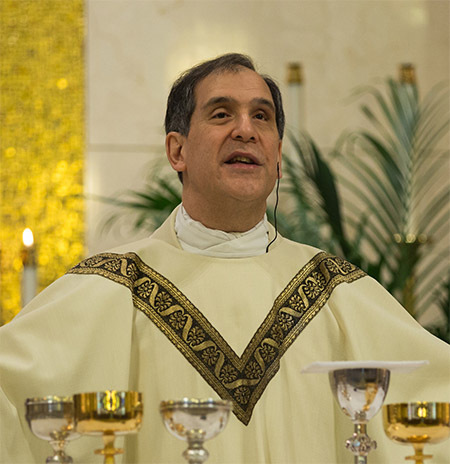 Father Bernard Ezaki speaking at Father David Matthew Anthony’s first Mass.